First impressions last forever. Immediately after shaking someone’s hand, take a bottle of antibacterial sanitizer from your pocket and clean your hand thoroughly so that they know you have good hygiene. Always have business cards on hand featuring your name, email, cell phone number, address, social security number, and credit card information. People are often quite busy during the workday, so always approach potential contacts by visiting their homes at night. Don’t neglect contacts in your professional network. Every few months, renew your relationships by mailing everyone you know a crisp five-dollar bill. Your college career center is a great resource for alumni contacts that haven’t been updated in eight years. Dress appropriately. A single tie is fine for business casual networking events, but a minimum of three ties should be worn to formal interviews. Asking, “So how did you get the job you have now?” is a great way to learn about some of the outdated, unhelpful ways people used to get jobs 15 years ago. Have you bought a nice button-down shirt, Geoffrey? You really ought to own a nice button-down shirt. Tell yourself this is your one shirt you won’t get wrinkly, because they’ll notice if it’s wrinkly. Make sure you button it up to the top, too. You don’t want to make it all the way to the interview and then not look good. It’s just common sense. 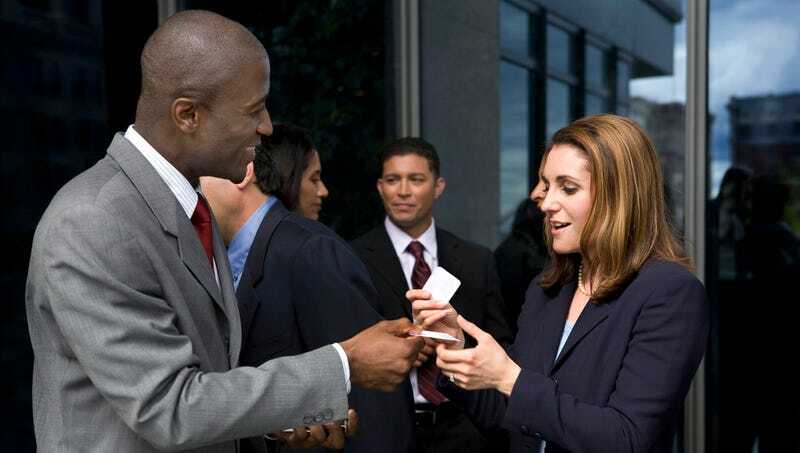 The keys to success at any networking event are eye contact, a firm handshake, and five to 10 years of work experience that perfectly align with what your prospective employer is looking for. No matter how insincere you are, try the best you can to hide the fact that you’re only talking to someone because you want to use them.